The structure of SSG/PS is detailed in the SCAR web site. Several groups will be reported upon to EXCOM individually and are therefore omitted here. These are the SRP’s (AAA and AntClim21), several Expert and Groups that have grown enough to deserve independent status (ISMASS and Oceans-SOOS), and those groups that are cross-SSG and have been assigned to the partner SSG; they will be dealt with in the partner SSG report (ECA, ATHENA, Acoustics, ICED, and Remote Sensing). identify assistance for the editing and publication of the final report. a communication team made up of SCAR and members of the AG should be set up by Easter 2014 to develop a communication strategy for the efficient dissemination of the key findings and the scientific report. the AG also requests a special session at the SCAR OSC in New Zealand in 2014. SCOSTEP: M. Candidi has resigned from the position of SCAR representative in the SCOSTEP bureau; SSG/PS suggests that Dr. Annika Seppala be nominated to that position, for a term of four years, to ensure that Antarctic perspectives be included in the overall Solar Terrestrial Physics programs. A special joint journal issue of Climate of the Past/The Cryosphere based on the Giens meeting. 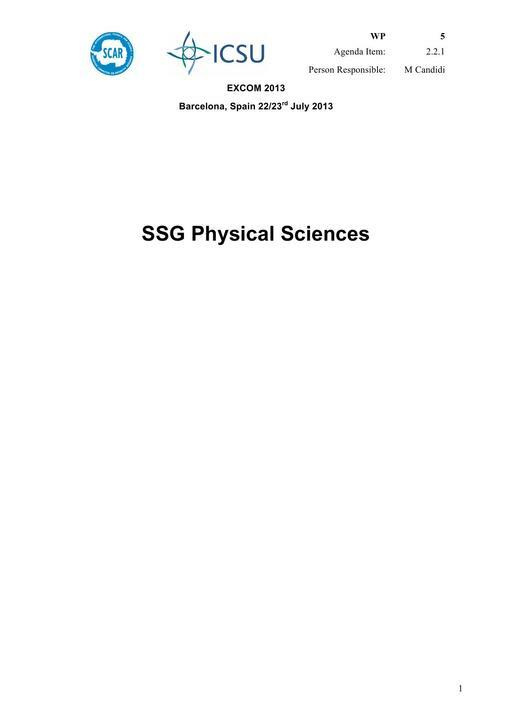 The Annals of Geophysics GRAPE Special Issue, sponsored by SCAR, is in publication. IPICS and GRAPE request additional funding for their activities.